The other day Disney announced all sorts of new features they were going to put aboard Disney Magic, but it seems the one most people are talking about is the top deck AquaDunk. The water slide starts with a 40-foot near vertical drop, and during the course of the ride, it sends riders out almost 20 feet beyond the side of the ship. It will be installed during a dry dock this fall. It's always a special occasion when a godmother returns to sail on her ship, and it's becoming more and more rare these days. Noted actress Marion Ross was aboard Emerald Princess this week during its transatlantic crossing to Europe. Ms. Ross was one of the four godmothers who named the ship in 2007 during a Mothers' Day-themed ceremony where two classic tv-mothers and their tv-daughters did the honors. The godmothers were Ms. Ross and her tv-daughter, Erin Moran, from “Happy Days” (Marion and Joanie Cunningham), along with Florence Henderson and her tv-daughter, Susan Olsen, from “The Brady Bunch” (Carol and Cindy Brady). 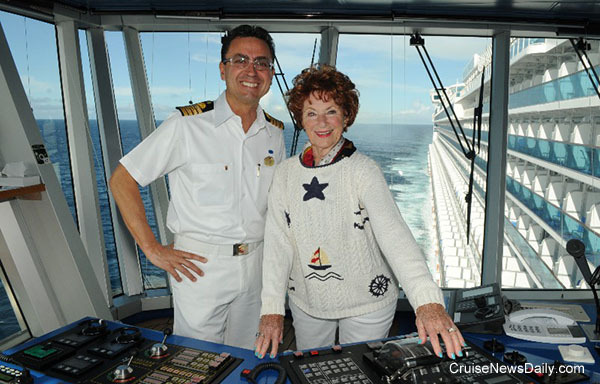 Ms. Ross was, of course, invited to check out the bridge of "her" ship, and she is shown here with Capt. Mario Ciruzzi on Emerald Princess' starboard bridge wing. A US Coast Guard C-130 flew 1,000-mile round trip on Wednesday (May 1, 2013) to deliver blood to an ailing passenger aboard Holland America's Oosterdam as it sailed a three-week cruise from the South Pacific to Vancouver. The Coast Guard plane left Sacramento with two units of blood donated from a local blood bank and dropped it by parachute to Oosterdam which was approximately 500 miles off the coast of San Francisco. It was quickly retrieved by seamen from Oosterdam and delivered to the ship's medical center.